UPDATE: My book Does Your Child See Sparkles? 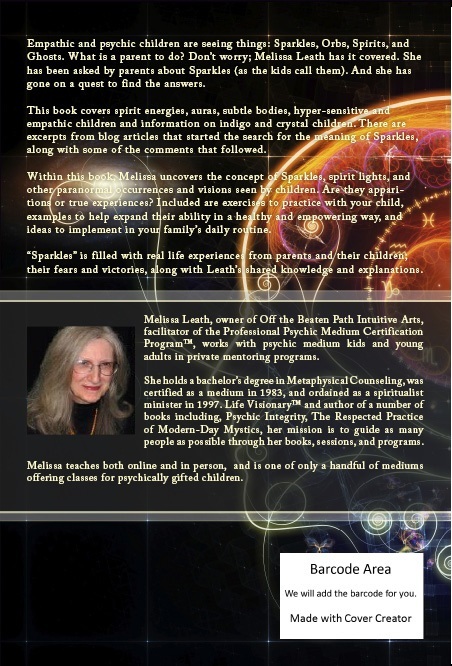 Help for Parents Guiding Psychic Kids is now here. Melissa Leath, owner of Off the Beaten Path Intuitive Arts, facilitator of the Professional Psychic Medium Certification Program™, works with psychic/mediumistic kids and young adults in private mentoring programs. She holds a bachelor’s degree in Metaphysical Counseling, was certified as a spiritual medium in 1983, and ordained as a spiritualist minister in 1997. Life Visionary™ and author of a number of books including, Psychic Integrity, The Respected Practice of Modern-Day Mystics, her mission is to guide as many people as possible through her books, sessions, and programs. She teaches both online and in person, has taught meditation and parapsychology courses at Clark State Community College in Springfield, Ohio, and is one of only a handful of mediums offering classes for psychically gifted children. She also is a regular featured radio guest. When I was young I used to see light specks in my room almost every night up until I was 10 or 11 years old. Everyone thought I was lying or making it up. I remember telling my mother, she thought it was something I was making up as well. What I saw looked light snow to me only it brighten the room. I was afraid and would hide my face under the blanket. I am in my 50″s now and my daughter, who has two little children told me that she saw the same thing and she used to put her hand out so they could land on her hand. She no longer sees them either. We were talking a few days ago and she asked me did I ever try to look it up on the computer, I told her no but I would and found this site. Thank you so much for the insight and the comments of others. I don’t know why as a child, I was so afraid but growing up I was afraid of my own shadow. Lol. My ten year old daughter just told me she sees sparkles everywhere, all the time, daylight, nighttime, all her life! She said there is a kind of black see-through screen behind the sparkles and then the normal world of colours, objects, etc. I’m absolutely astounded! I am 54 years old and had never saw the sparkles before the night my precious Mother passed away on 6-6-14. I have been searching for a answer for over 6 months now but I knew then that it was a precious gift GOD was giving me to soothe my broken heart. I have been wishing for her to come to me in my dreams, so far it hasn’t happened but I am not loosing hope. Thank you so very much for your very comforting explanation of the magnificent sparkles. May many blessings come your way. My name is Tamara and I have a 6 year old daughter who havs been seeing these “sparkles” or lights as she calls the since she was about 3. She still talks about them, only if I ask her and is very shy about speaking on the subject. She has even drawn a few for me to be able to understand what she was talking about. I don’t know anyone like this and I would like to be able to understand more so that I could help her understand them as well. She also used to see a little girl in my room when she was 2 and then at 3 stopped seeing her and started talking about the sparkles. Any advice on my next step with her? Thank you! Thanks for your thoughts Tamara! Just let her know (when she tells you about these things) that you believe that she saw them. Even if you do not understand or see it too, it is important that she knows you believe her. You do not have to ask her about it. She will share when she wants to. You are doing fine! Beautiful lights showed up outside our home on the 7th of December. They change every morning and night. During the darkest part of the night we can see dozens. The colors are blue, white and usually one or two red. The red are larger then the white, the blue are all sizes. Last night my husband saw them in our bedroom. We have been seeing “lights” for about 35 years, but never this many and never for so many days in a row. It’s a wonderful gift and makes us feel like we need to watch our minds and hearts every second. We think these are angels, but the truth is…we just don’t know. My son is 3.5 for a while he has slept poorly and then would wake up startled, scared and talking about ghosts. We prayed for the ghosts to go away and then he was very very sad and had a complete meltdown because “ghost went bye bye and he wanted to play with ghost.” He kept waking up and would stare at something in the room that I couldn’t see after waking but would not talk to me about it. I had a lady come and do a clearing. He is occasionally still very distraught about the ghost going bye bye and how he wants to play with the ghost. He also said when we were outside that there were lots of ghosts in the sky. I’m not sure what to do. He doesn’t really seem scared of them. Thanks Maggie for you comment. We as parents sometimes act too quickly when wanting to protect out children. But right now the best thing for you is to talk very openly to him about the situation. Let him know that as he gets older, he will have more changes to connect with the “ghosts”. But I have to say that the term “ghost” is not a good one for you to use. He must have seen a movie about them and picked up that term. You might do well to read my book Does Your Child See Sparkles? (as shown in the side bar on this blog). It explains so much more than I could go into here. This situation is much more common and natural than you may recognize. Take some time and read all the articles here related to Kids seeing sparkles. It will help. Hi, i am 25 years old and i am seeing colored sparks and colored rays as well as e norm clusters of colors, occasionally. Some background; I am diagnosed schizophrenia ever since 2014. The small colored sparks seen started to show up somewhere ending 2012, starting 2013. It wasn’t after my first psychoses that i started to see them more frequently. Well, all went fine until i had my second drawback, another psychoses in 2015. This time i had attacks, which i call them, i also called them dream attacks for a while. During such dream attack/moment i would see allot of colors constantly, even pictograms of figures, round balls, colorized and the most magnificent thing i see is somewhat like a small supernova like spectacle. One thing bugging was that i was very afraid during such state of mind. At the present i still have dream attacks. Sometimes it takes up to 3 days and sometimes 2 weeks but they stay frequent ever after i left the clinic this year around February. My thoughts; I think the colors represent communication on vibrational levels. May it be negative or positive. Sometimes my awareness changes and a light shows up. Mostly blue, which i think is positive but i also see red allot but not as much as blue, luckly, as i have a negative ideas about red. Ooh yeah, i sometimes change awareness slightly and colors pop up but also sentences at the same time, which references communication. Although its not always accurate to my understanding but sometimes very help full to continue manifesting. One more example; i see a red dot/square like colored spark with a black dot/square like spark every since after my second psychoses. Until now i only have a negative concept regarding these red and block dots/squares. Because they show up in times when i don’t want them and only manifest negative sentences. Is there more that follows up onto my story what could be help full in the development of interpreting these lights, if so, i would very much like to become known of that knowledge. Thank you Danny~ I will open this question up for other readers on this blog. I hope someone has experiences to share with you. Hi there, I’ve posted before that I’ve seen sparkles (I’ve always called them dream dots) as a child and adult. As a child they would dance and swirl, mimicking whatever shapes I would think of in my mind. I’ve also always dealt with sleep paralysis (I’m awake and can sometimes see these staticky what I believe are figures, not exactly like my dream dots). This was very uncomfortable and scary as a child, but as an adult I’ve actually learned how to wake up or go explore. So fast forward. I have a 13 month old son. I believe he is having night terrors. Usually an hour in to sleep, but happens throughout the night sometimes. He sometimes stands for minutes staring around. Sometime up at the ceiling. Sometimes I’m not sure he is awake or realizes I’m there. Sometimes he has night terrors. It’s Textbook night terrors. I’m not sure what he sees or if he is indeed in that twilight paralysis state. I do my best to calm him. And he normally goes immediately back to sleep. Have you come across anything that ties these together? Maybe he experiences what i did as a child? He is a happy child and in a caring and nurturing environment. I don’t get the night terrors. Or what could be upsetting him other than something extremely uncomfortable/indescribably (especially at this age) bc he never cries and screams like this. Heart wrenching. Shanna, I don’t know much about night terrors. However, I believe they could be part of psychic awakening or awareness of spirit entities. I hope someone reading this blog can bring some light to it.All the best for you and your son. My daughter was crying tonight because she didnt want to see the dots. they fall from the ceiling and she just wanted to go to sleep and not see them. she has been saying recently that she is seeing things in her room and we have found her crying in fear under her bedding on a few occasions in the middle of the night. she is 4.5 years old. today was the first time she told me about the dots. should I do a clearing in our house? I had two friends when we first moved in tell me they were pretty sure there were some spirits in here and it was hard for them to sleep. they had not spoken to each other but were both sure of it. when i was still nursing I would have to go up in the middle of the night and feed her and I would always have a bit of fear. she finally fell asleep tonight after I turned on the light. she was very confused that I didnt see them.